Decorated with a fruit-and-flower motif in a yellow border, the Crock-Pot on the yard sale table looked straight out of the 1970s, when this kitchen appliance first hit the market. I wondered if it would work, but the price was right at $4, so I took it home, plugged it in, and eventually made a batch of Hungarian beef stew. According to the official Crock-Pot web site, this appliance started as a bean cooker but its uses expanded. Now people call it a slow cooker and the stainless steel sides make it look much sleeker. The newest models even connect with your smart phone so you can turn them on remotely. A flea market yielded a 50-cent companion to my yard sale bargain: the Rival brand Crock-Pot Cooking book, published in 1975. “Cooks all day with the cook’s away” the blurb on the back cover promised. Since my summer job keeps me busy at odd hours, I liked that retro idea. Though beef stew hardly seems like summer fare, I wanted something hearty for a pot luck, and the Crock-Pot doesn’t heat up the kitchen the way an oven would. Best of all, I put together my ingredients before I went to bed and woke up with a meal ready for later that day. A seasonal bonus: the red pepper and parsley came from local farms. I substituted beer for beef broth, which may seem weird, but the recipe only needed half a cup of liquid and I was in no mood to go out to the store at midnight to look for one missing ingredient. Red wine or even water would have worked fine, too. When I was cooking, I found a Classic Rock radio station blaring Led Zeppelin, Cheap Trick and Aerosmith to enhance the 1970s theme. Fortunately, my cooking skills have improved since the first time I listened, when all I knew how to make was brownies from a mix or scrambled eggs. Place the beef, onion, potatoes, carrots, lima beans, garlic, pepper, and parsley in the Crock-Pot. In a bowl, mix the broth or beer, paprika, salt and tomatoes. Pour over the top of the beef and vegetables and stir to blend. Cover and cook on low setting for 10 to 12 hours. Serve with rice, noodles, or quinoa. 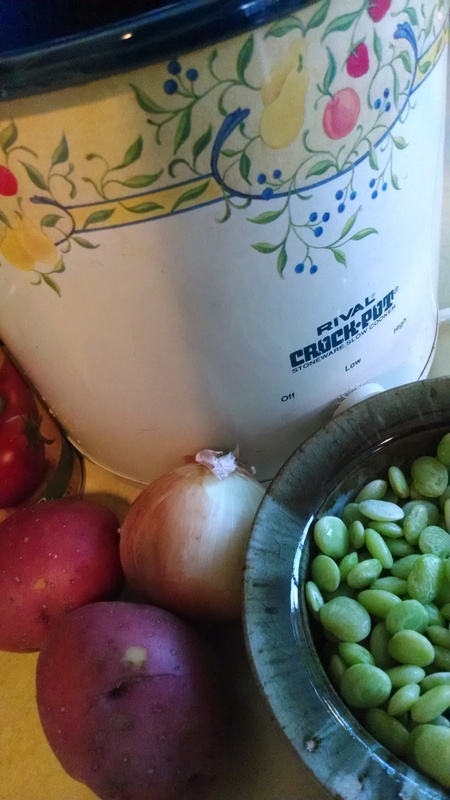 This entry was posted in cookbooks, Food, History, memoir and tagged 1970s, beef, beef stew, beer, Crock Pot, Hungarian, lima beans, paprika, red pepper, slow cooker, Stew. Bookmark the permalink.